The Retromen are James Caldwell High School's male acapella group, an extra-curricular ensemble that meets once per week. The Retromen perform most of their work in two, three, or four parts, consisting of Tenor, Baritone, and Bass. They sing music from various styles including traditional choral repertoire, barbershop, classic songs from the 50's, 60's, 70's, 80's and 90's, and arrangements from current hits. Repertoire highlights from the last two years include a Jersey Boys Medley, Blue Moon, Rhythm of Love, Little Lion Man, Magic Carpet Ride and In the Still of the Night. This year, scheduled appearances include the JCHS Small Ensemble Showcase, the JCHS Music Marathon, the JCHS Art and Tech Show and the Highlands Acapella Festival. The JCHS Jazz Band is the most experienced Jazz ensemble in the district. The group practices on Monday nights and is conducted by Mr. Lienhard. The ensemble performs at "The Music Marathon", the annual JCHS Music Dept. tour, the "Jazz Spectacular", and at the "Arts and Technology" show. Repertoire is selected from a wide array of styles and emphasis on improvisation is encouraged. This is an "extra-circular" ensemble that enjoys learning and performing music! This is an auditioned ensemble, which specializes in the music of the Renaissance, as well as music from the 20th century. This ensemble performs in the community in full Renaissance costumes as well as utilizing jugglers, poets and a bit of acting. The Women of Note derives their name from the famous jazz band of the U.S. Air force: The Airmen of Note. This ensemble specializes in music written and/or arranged for the woman's voice. Currently in rehearsal are Who can Sail, a lovely Finnish folk melody; Three Hungarian Folk Songs by Bela Bartok, and a complex 3-part jazz arrangement of Chattanooga Choo Choo. The repertoire of this ensemble varies widely from classic pieces through Doo Wop and Jazz standards. The Concert Chorus Program is comprised of two groups, one is an all girls ensemble (SSA) and the other a mixed group (SATB) , who perform a wide variety of choral literature. To find out more click here. Quality concert band programs have been a long-standing tradition in James Caldwell High School. Over the years there has been a number of transformations in the scope and sequence of the program, which is contributed by either grade configuration or student enrollment. James Caldwell High School currently has two concert bands named the “White” and the “Blue” in reference to our school colors. The “White” band is a cadet band primarily comprised of freshmen and sophomores. The “Blue” band takes on more of a wind ensemble setting and is usually reserved for juniors and seniors. Each band is unique in it’s own way and is clearly identifiable in its objectives. Our goal is to provide each ensemble with a variety of level appropriate repertoire that enables them to grow as musicians. Through this process, we hope that our students gain a deeper appreciation for the art, take pride in their product, and achieve their fullest potential as life-long learners. 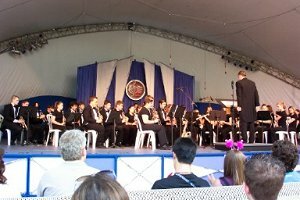 Concert band is a full year elective course offered at our high school and is better known by its registration name, Music Performance. Music Performance is the final component in our comprehensive winds and percussion program in the Caldwell-West Caldwell Schools. Students are given the opportunity to play a wind or percussion instrument as early as fourth grade. We even have a small percentage whom elect to begin either in the middle school or high school. Each band has over sixty members and performs concurrently at a variety of venues throughout the year. One of our highlights is the annual Winter Concert held each December in the James Caldwell High School auditorium. Each year, we sell a CD recording of the concert. Another highlight is the annual Bands and Woodwind Ensembles concert held in the same location in early May. Many of our students elect to tour with the ensembles each year to areas like Boston, Toronto, Montreal, Washington D.C., and Williamsburg VA. In April 2003, the groups are designated to perform at Epcot Center in Walt Disney World. Both ensembles rehearse each day but at different times. Our students are dedicated in the program and collectively work hard towards making good music. Working with both groups is both fun and rewarding. They somehow manage in stay active in our music department while remaining involved in a variety of activities. We are extremely proud of them and their accomplishments. To find out about the grading policies for Music Performance and the concert bands, click on Music Performance Grading Policy. There is a long-standing tradition in the Caldwell/West Caldwell School District. That tradition is the Caldwell/West Caldwell string program. Currently there are approximately 200 strings students in the elementary school, 45 in the middle school, and 45 in the high school. We offer violin lessons in second grade, and the other string instruments in third grade. This is the third year working with the orchestras and we have had some great experiences. In April of 2012 we went to Boston and had a workshop at Boston College. In October of 2002, we hosted the Shanghai Quartet. (You can see their web site at: s h a n g h a i q u a r t e t . c o m.) It was a wonderful performance, which truly inspired the students in the music department. 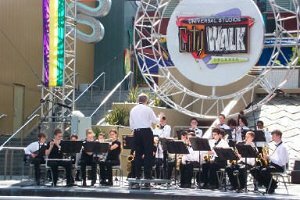 As recently as spring of 2011, the JCHS Orchestra performed at Walt Disney World, in Florida. James Caldwell High School has two main groups, the String Orchestra and the Symphony Orchestra. The string orchestra is made up of violins, violas, cellos, and double basses. The Symphony Orchestra is made up of woodwinds, brass, percussion, and strings. These groups study music by Mozart, Beethoven, Hindemith, Copland, Holst, Ellington, and Barber. Some of the major works performed have been; The Red Pony Suite, The Russian Sailors Dance, “Jupiter” from the Planets, St. Paul’s Suite, Adagio for Strings, and Finlandia to name a few. The String Orchestra rehearses everyday but Thursday, when the Symphony Orchestra rehearses. We are very proud of the growth these groups have shown in a very short time. The students have worked very hard and should feel proud of their accomplishments. To find out more about the grading policy for Music Performance and orchestra, click on Music Performance Grading Policy. This is a conductorless group that primarily performs chamber music. The main goal of this group is to improve listening and watching skills. The group will perform several times in a number of different venues. 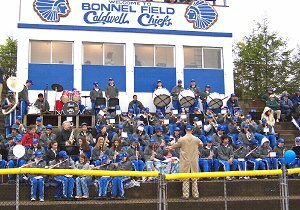 The James Caldwell High School Spirit Band plays an integral part in both the Music Department and Athletic Department. The Spirit Band attends all Pep-Rallies and Varsity Football Games, providing music and excitement for all. The repertoire performed consist of a variety of styles; from Motown, to Classic Rock, to Popular Music, and of course traditional football fight songs. To find out more click here. The James Caldwell High School Percussion Ensemble is a performing chamber group that explores and performs the various aspects of the world of percussion. The ensemble gives percussion students the opportunity to learn and experience all the various families of percussion instruments; the wood family: xylophones, marimbas, woodblocks, temple blocks, etc, the skin family: drums, timpani, etc, and the metal family: cymbals, triangles, etc. Over the years, the Percussion Ensemble has become a well known chamber ensemble within the JCHS Music Department due to their performances that provide the audience with an experience that is not only musically exciting, but visually as well.